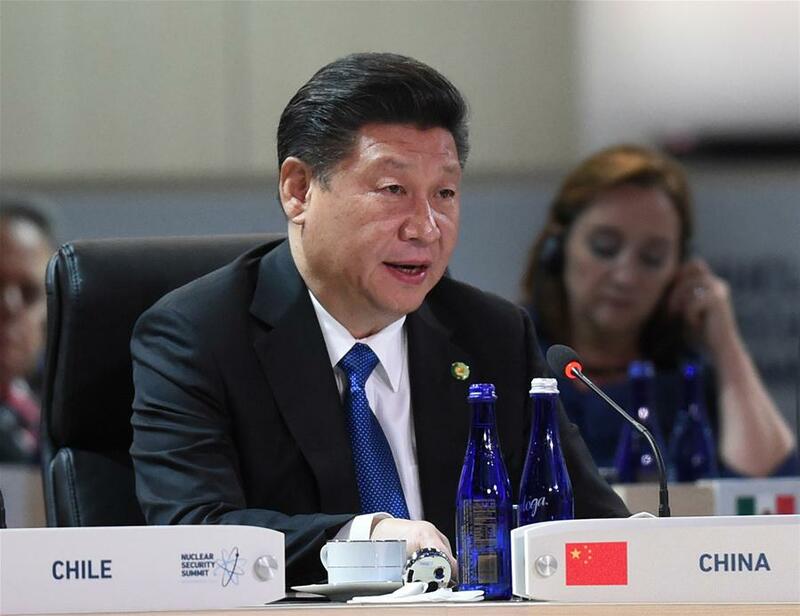 WASHINGTON, April 1 (Xinhua) -- Chinese President Xi Jinping on Friday urged countries around the world to increase national input and expand international cooperation so as to further firm up the global nuclear security architecture. In a speech delivered here at the opening plenary of the fourth Nuclear Security Summit (NSS), Xi recalled that he envisioned the building of a global nuclear security system featuring fairness and win-win cooperation at the third NSS in The Hague. In order to realize that goal, which will "provide strong and sustainable institutional guarantee for mankind to benefit from nuclear energy with security," Xi laid out a four-pronged proposal for the international community to make fresh efforts. Countries across the world need first to step up political input and stick to the direction of addressing both symptoms and root causes, said the Chinese president. "As national leaders, we have the responsibility to ensure that nuclear security gets adequate attention," he said, adding that only with a solution that addresses both symptoms and root causes can the world "remove the breeding ground of nuclear terrorism at an early date." The international community, Xi said, also should step up national responsibility and tighten up a line of defense that is sustainable. Pointing out that as a country makes its own choice to develop nuclear energy, it bears unshirkable responsibility to ensure nuclear security, the Chinese leader suggested that day-to-day prevention and crisis response must go together as the threat posed by nuclear terrorism is highly asymmetrical and unpredictable. Meanwhile, concerted efforts should be made to step up international cooperation and enhance the momentum of coordination for common progress, Xi proposed. Citing the fact that "nuclear security incidents will have impacts that go beyond national borders," he said existing international organizations and mechanisms can serve as solid platforms for international cooperation on nuclear security in the future. The International Atomic Energy Agency, the world's nuclear watchdog, "can play a central role to coordinate and consolidate global resources for nuclear security, and use its professional expertise to serve all countries," he said. "As the most universal international organization, the United Nations can continue to play an important role." In addition, the international community needs to step up the culture of nuclear security and create an atmosphere of joint efforts and shared benefits, he said. "The awareness of the rule of law, the sense of urgency, and the spirit of self-discipline and coordination are central to the nuclear security culture," Xi pointed out. "It is equally important that the academic community and the general public also foster the awareness of nuclear security." The NSS, a biennial event initiated by U.S. President Barack Obama, gathered leaders and envoys from 52 countries and four international organizations this year. The six-year-old mechanism would come to an end in its current format after the 2016 meeting. In his speech, Xi noted that the NSS process has provided a major boost to international nuclear security, including developing common goals, establishing key priorities and mapping out the blueprint for the future. However, he pointed out, new threats and challenges keep emerging in the security field, the root causes of terrorism are far from being removed, and nuclear terrorism remains a grave threat to international security. "A more robust global nuclear security architecture is the prerequisite for the sound development of nuclear energy," he said. "The conclusion of the Nuclear Security Summit will not be the end of our endeavor, rather it will be the beginning of a new journey."